Monarch Air Group provides private air charter in Elgin, Moray, UK. Our clients benefit from top-notch service, unrelenting dedication to safety, wide selection of aircraft, and years of experience in chartering private jets. To obtain a free quote, please use our online quoting tool provided below, or call toll free 1-877-281-3051. Monarch Air Group provides private jet charter flights in and out of Elgin, Moray, UK. Elgin is a former cathedral city and the commercial and administrative centre of Moray, Scotland. The city’s economy is mainly based on local authority, real estate, construction, food and drink, transport, tourism, business services and retail/wholesale. 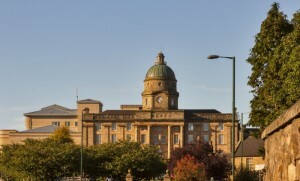 Elgin is considered to be one of the most expensive cities in which to buy property in Scotland. The most popular tourist attractions are Elgin Museum, Cooper Park, Elgin Golf Club, Moray Jazz Club, The Lantern Gallery, Moray Leisure Centre, and many others. Elgin has something to offer for everyone from golf, tennis and badminton to swimming and boating, and attracts both business and leisure travelers from all parts of the world. 1. ABZ, Dyce, Aberdeen, United Kingdom. 2. CRN, Cromarty, Cromarty, United Kingdom. 3. DOC, Dornoch, Dornoch, United Kingdom. 4. FSS, Kinloss, Forres, United Kingdom. 5. INV, Inverness, Inverness, United Kingdom. 6. LMO, RAF Station, Lossiemouth, United Kingdom. 7. WIC, Wick, Wick, United Kingdom. 8. ZIV, ScotRail, Inverness, United Kingdom.